★Yasuo Miyazawa, president and founder of Seisa Group, received the Honorary Title of Saipan-Japan Ambassador for Peace and Goodwill. The PAL program has started in 1986 between Mariana High School in Commonwealth of the Northern Mariana Islands and Seisa High School. This year marked the 28th year of the schools’ “Participate and Learn” Saipan and Japanese history together and understand peace together program. 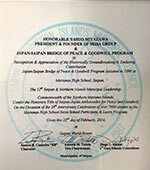 The 12th Saipan & Northern Islands Municipal Leadership, and Commonwealth of the Northern Mariana conferred the Honorary Title of Saipan-Japan Ambassador for Peace and Goodwill to Yasuo Miyazawa, on the occasion of the 28th Anniversary Celebration of over 7000 alumni in the Mariana High School-Seisa School Participate & Learn Program. Mr.Yasuo Miyazawa is the first person to be conferred the Honorary Title of Saipan-Japan Ambassador for Peace and Goodwill. Mariana High School students will visit Japan in January 2015. According to MHS principle Charlene Cabrera, “ Seisa students and MHS students found the way how to communicate each other to share hopes and wishes. Seisa students visit gave 240 MHS students wonderful opportunities to practice Japanese language they have been learning. There are some students who like to study in Japan after graduation of MHS." We are looking forward to see MHS students in January 2015.